Even in sunny Southern California, the days occasionally turn brisk and cool. When the weather changes, nothing is more intimate and inviting than a roaring fire, which is why more and more Californians are choosing to have a fireplace installed in their homes and businesses. SoCal Fireplace Mantels is the leading provider for marble fireplace mantels in Los Angeles. 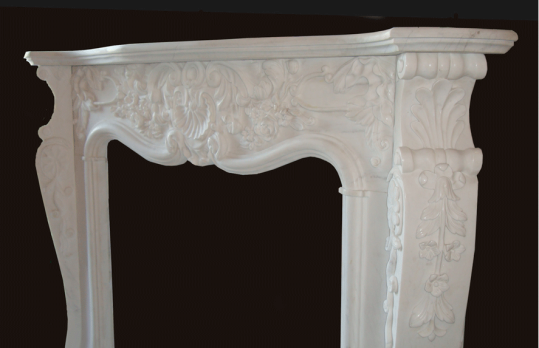 Our selection of marble fireplace mantels is unmatched. Marble is ideal for fireplace mantels because it has an elegant, classic look that adapts well to any design. Whether your room is furnished with antiques or with contemporary furnishings, marble lends a touch of class and elegance. The delicate patterning in the stone draws the eye and invites you to look at the fine details of the design carved into the mantel, making it the true centerpiece of the room. In addition, marble remains cool to the touch even when a hot fire is built in the fireplace, protecting your mantel clocks and other valuables that you may wish to place on the mantel. SoCal Fireplace Mantels strives to be the premiere Los Angeles marble fireplace mantels provider. Although most people think of the classic white marble when they imagine a marble fireplace mantel, we have marble fireplace mantels in a large selection of patterns and colors. From creamy white marble to antiqued yellow marble, rustic red brown marble, cool beige marble, dramatic white and maroon marble, and every color in between, we have a marble fireplace mantel that is ideal for the décor of your room. In addition to being the leading provider for marble fireplace mantels in Los Angeles, we also carry a large selection of cast mantels, overmnantels, and architectural precast products such as columns, facades, statues, and much more. SoCal Fireplace Mantels can take care of all of your fireplace and stone carving needs. Come to our 4000 square foot showroom in Van Nuys and experience for yourself why we are the most sought after Los Angeles marble fireplace mantels provider. Our knowledgeable sales staff is happy to show you around and to help you select the right mantel for your needs. We offer fireplace mantels in Los Angeles, Orange County and Ventura County.